Western capitals remain on high alert, days after hundreds of Londoners were killed and injured by Islamic terrorists. 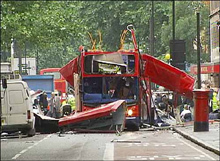 While a definitive source has not yet been identified, the bombings earlier this week in London bear all the hallmarks of al-Qaeda. The world has once again been reminded of the barbarity of the "Islamo-fascists," to borrow New York Times columnist Tom Friedman's phrase. "Islamo" because the term suggests "pseudo," or a false Muslim; fascist because the terrorists are mechanically adroit at executing their butchery. While it bears repeating that the perpetrators are not representative of the Muslim community, al-Qaeda's hope of igniting a culture clash continues to be a distinct possibility. The bombings have also highlighted the massive disconnect at the heart of the Blair/Bush doctrine. The world is supposed to be safer without Saddam Hussein. Clearly, it's not. Western capitals are lined up like clay pigeons waiting for the next "inevitable" attack, as London Police Chief Sir John Stevens warned back in March 2004. London Bombings Put Pressure Back on U.S.
A glance at last week's G8 Summit in Gleneagle, Scotland, reveal that Muslim leaders remain as detached from the West as African musicians were from the Live 8 concerts. Almost four years after the 9/11 attacks both the Blair and Bush administrations' largest failure remains their inability to engage in a sincere dialogue with Islam. As well as pointing the finger at Muslim clerics and demand they condemn the attacks, pressure should also be applied to Christian clerics to do the same to G8 leaders. After all, they refused to resolve the unjust trade practices that lie at the heart of African poverty. Or how about the electricity and water shortages that cripple daily life in Baghdad? If the West continues to fail the developed world more attacks will indeed be inevitable. 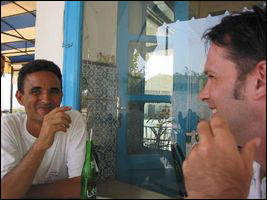 A few summers ago my wife and I traveled to the North African country of Tunisia in an attempt to seek out our own personal dialogue with a Muslim country. The 9/11 attacks had provided an awakening for us, a spur for further inquiry to try and understand the root causes. I began searching for what the late Zen master Shunryu Suzuki referred to as "beginner's mind," one that is flexible and open to all possibilities. We also did what many others did; embraced those closest to us. My wife and I reflected on our marriage as a Japanese and a Canadian, and were able to salvage our faith in the belief that individuals are more powerful than events or institutions in bridging cultural divides. So, we began planning a trip to Tunisia. It seemed like a practical destination, open and more stable than some other Arab states. Then something unexpected occurred. 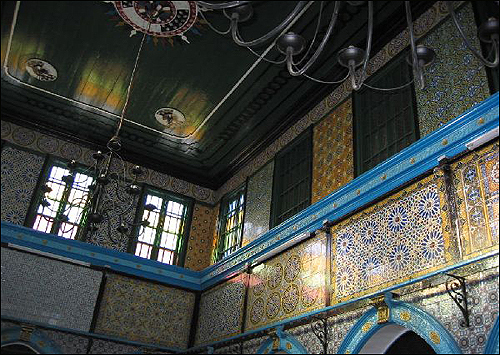 A bomb blast at the Ghriba Synagogue on the island of Djerba killed 19, 14 of whom were German tourists. This shocking news was made even more so by the alleged involvement of al-Qaeda. After some serious hesitation we continued on with our plans, convinced that this attack was an aberration for normally moderate Tunisia. We have no regrets. Wherever we went we were warmly welcomed and greeted with generous hospitality. Our most remarkable experience occurred while visiting the same Ghriba Synagogue with a new friend Hamza, an economics student and a Muslim from the southern Tunisian town of Medenine. The synagogue had been repaired and there was a visual security presence on the site with police checking ID and passports. We had met Hamza before in the main town of Houmt Souk and he offered to guide us around to a few local sites. He spoke fluent French and English, as well as Arabic. What seemed ironic to us, a Muslim introducing us to this Jewish synagogue in an Arab country, was nothing but a sincere expression of pride for him. He considered the Jewish population to be as Tunisian as the other Berber and Turkish minorities and was proud of his country's ethnic diversity. Hamza had proven my initial expectations to be naive, parochial and ultimately prejudicial. Somehow I had harbored the belief that Muslims were different. I knew all Christians didn't hate Muslims; why did I expect all Muslims to hate Jews? Of course, they don't. Hamza and his homeland had provided me with a valuable epiphany. They made me see that my knowledge of the Arab world is minute and that my ignorance had prevented understanding. 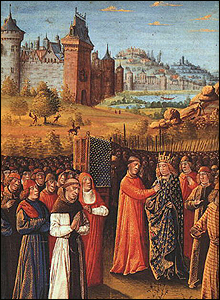 St. Francis of Assisi sets out for Morocco in 1214 on his second attempt to convert the "infidels." Growing up in Canada, not surprisingly, I learned the canon of Western civilization, including much about Judaism and Israel. Throughout high school the curriculum rightly encouraged me to sympathize with Jews through the lessons of the holocaust. The establishment of Israel and its justification has always implicitly and naturally flowed from this horrific event. However, the Arab victims of the Christian Inquisition in the 15th century who perished or were forced to flee Europe to North Africa were never mentioned. The experiences of the modern Palestinians were hardly given a voice. As a result, I have had to go far out of my way to learn anything about Arab history or the Islamic faith. In my native country this ignorance is pervasive, promoting a biased media and an unintentionally prejudicial populace. School curriculums and textbooks still must be adjusted to include Arab and Islamic history. Unconscious ignorance can be the greatest enemy in any fight against terrorism. As I have inquired and learned more, the scales have begun to fall from my eyes. The Arab world, like the Western world, is anything but a unified monolith. There are deeply held suspicions and prejudices between countries and religious sects. Saddam Hussein despised Muslim extremists as much as George W. Bush. The Indonesian Muslim cleric, Abu Bakar Ba'asyir is as representative of Muslims as the American evangelist, Jerry Falwell is of Christians. Ba'asyir openly supported Usama bin-Laden; Falwell stated that the prophet Mohammed was a terrorist. Both are extremists who ultimately poison their own faiths. These similarities need to be pointed out repeatedly as a reminder that no culture has a monopoly on ignorance or truth. Through these experiences I have come to realize that seemingly pedestrian acts like choosing a vacation spot or a book to read are in fact profound expressions of political import. 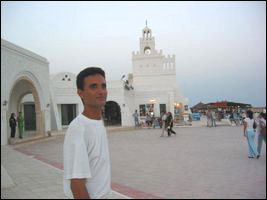 The fact that Tunisia is not only an Arab country but also a Muslim one became a significant reason for visiting. It would not have mattered before, and indeed, may have been a deterrent. In the wake of the London bombings, it is more imperative than ever not to ignore or avoid questions or journeys that may seem uncomfortable or unsavory. Anger and despair are self-perpetuating traps that must eventually give way for a deeper understanding to emerge. Small acts can be intensely meaningful and a dialogue can take on many forms. As I stood together with Hamza and my wife inside the beautiful blue sanctuary of the Ghriba Synagogue wearing our borrowed yarmulkes (skull caps), I caught a glimpse of the possibilities that emerge when people step into different cultural habitats. "The innocence of first inquiry," to quote Shunryu Suzuki once again, is the hallmark of the "beginner's mind." Our first inquiry had led us to Tunisia. Where we go now remains an open question, but one thing is certain -- our choices will not be guided by fear.